Common name: Freckled milkvetch, rattleweed, loco weed. Description: 3-50 flowers on inflorescence usually many branched ascending or spreading, petals purplish, cream, whitish, or mixed purplish and whitish. 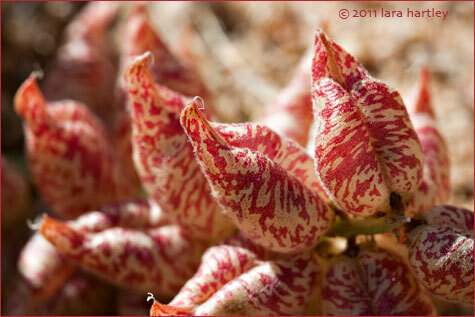 The mottled, papery pod/fruit is probably the most characteristic feature of this plant. Leaf: 1–15 cm; leaflets linear to widely ovate. Stems and leaflets are a grey or silvery shade of green. 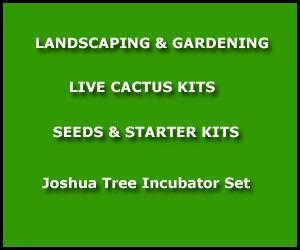 Habitat: Sagebrush Scrub, Shadscale Scrub, Alkali Sink, Subalpine Forest, Foothill Woodland, Yellow Pine Forest, Valley Grassland, Creosote Bush Scrub, Joshua Tree Woodland. Generally dry, open places. Notes: Photographed Mar 3, 2010, near Short Canyon, on water pipeline road, Mojave Desert, Kern County, Calif. 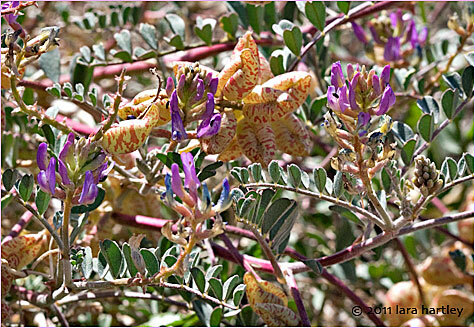 The seeds make a rattling noise in the dried pod which is the basis for one of its common names. Cattle and horses display a decidedly crazy behaviour, "loco" in Spanish, after eating this plant and that is why it is called loco weed. This is a highly variable species depending on locale. 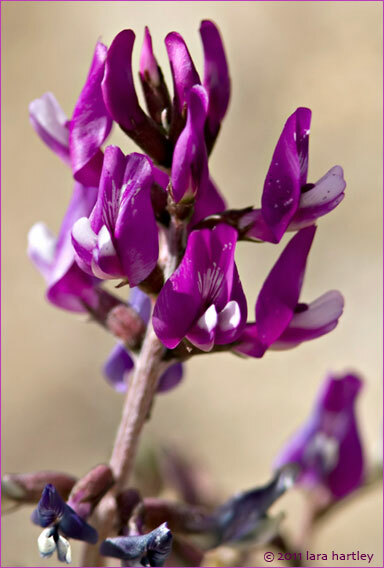 Annual or perennial herb that is native to California and is also found outside of California to Washington, Wyoming, Idaho, Colorado, and New Mexico.